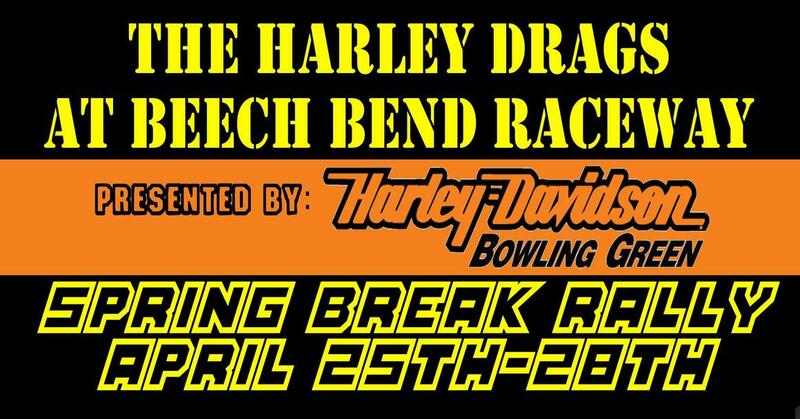 The Harley Drags Spring Break Rally at Beech Bend Raceway! Come on out for an action packed weekend at The Harley Drags! The Spring Break Rally features AMRA All-Harley Drag Racing Saturday and Sunday. Live Music Friday & Saturday Night by American Maid! Biker Rodeo! Burnout Contest! Stage Contests! Karaoke! Mechanical Bull Rides! FREE Bike Show! Camping RV Electric & Water first come first serve. FREE Hot Showers. Bring your own golf cart in FREE.